'The Invasions of England and Ireland with al their Civill Wars since the Conquest'. Sold George Humble, 1627. A finely engraved hand coloured map with an attractive title cartouche that is surmounted by royal arms, a compass rose and rhumb lines. The content of this map features the invasions and internal strife of 1066-1588, that culminated with the Spanish Armada, which fills the English Channel but gradually diminishes to mastless wrecks to the north of Ireland. 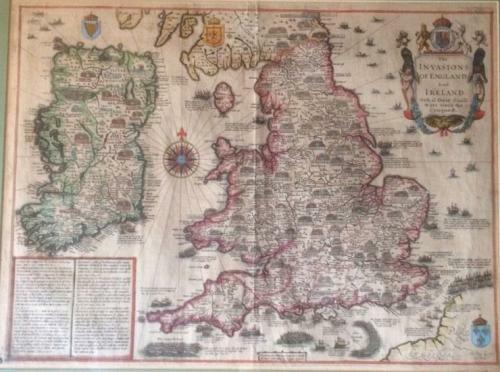 The map is in very good condition with only very mild toning in the margins. Pictured framed.